Bicycle! Bicycle! : If You Bike It, They Will Spend? If You Bike It, They Will Spend? Despite being a Bicycle Backwater, the internet ensures that it doesn't take long for trends to filter through to Australia. We've suffered the same waves of fixies and tweed rides as everyone else which is why I was surprised that it's only in the last 12 months I've started seeing bicycles in retail marketing. I'm not counting the plethora of 'put a bike on it' merchandise in home-wares stores, that's been around for as long as we've been printing squirrels and birds on cushions; I'm talking about bicycles in shop windows. 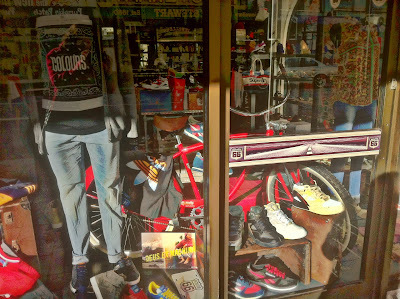 In my own microcosm of Northern Tasmania I have seen three separate shop windows featuring bicycles. It may not sound like many but statistically it's astonishing. Obviously the 'young, surburban cyclist' is officially a target market but if these displays are any indication that market is firmly defined as 'leisure' rather than 'transport'. Retailers here want to capture those cycling dollars but still do not see bicycles as anything other than toys. Regardless, it pleased me to see them because it's a step in the right direction. 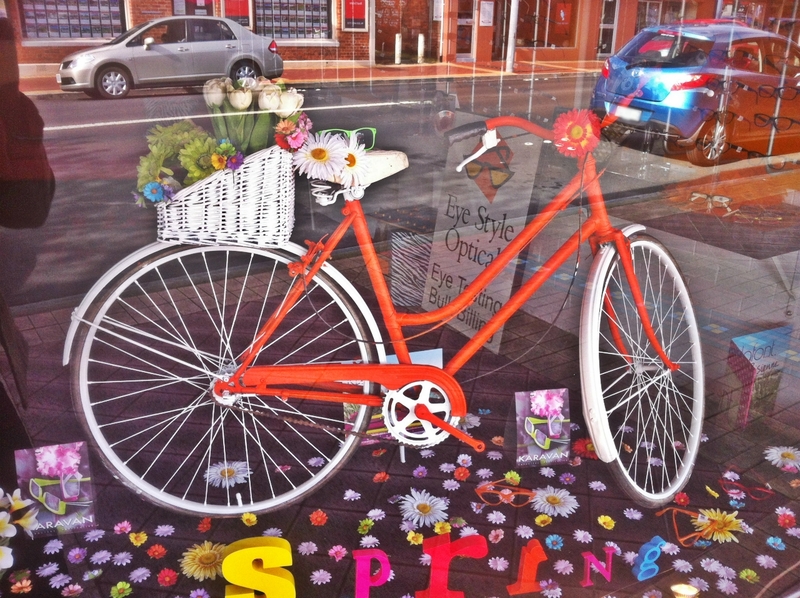 I saw this pedal-free budget respray in the window of an Optician, heralding the start of spring. I wondered if it was in basic working order and waiting to be a project or if it was on its way to the local tip. Though an optician is usually a gender neutral environment this bike was clearly there to symbolise GIRLY FUN and play on images of youthful femininity while appealing to the 'retro cool' Hipsterette (hence the brightly coloured, plastic cat-eye frames). Florals! Spring sunshine! BUY GLASSES! You're already a four-eyed outcast, why not be universally hated and get on a bicycle?! The second one is a bit hard to make out, being so draped and surrounded by branded attire. 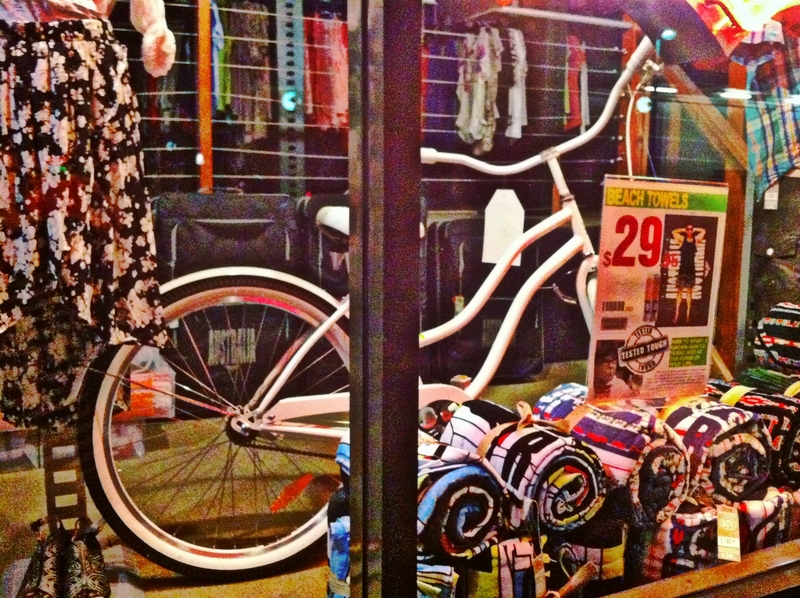 This was a clothing shop for young men and teenage boys so the inclusion of something so potentially dorky as a beach cruiser along with the Adidas is in many ways remarkable. When you break it down, though - it's another point in the 'Bikes are toys for the idle middle-classes' column. The branded clothes are firmly targeting youth with a parentally-provided clothing budget and offering the kind of bland street cred all middle-class teenagers crave. After all, what kind of male would be aimlessly riding an upright bicycle while wearing regular clothes? One who cares a lot about 'kicks' and is not yet old enough to drive, of course! The third one is most recent and most promising for what it says about the changing perception of bicycles. This is the current window of a nation-wide clothing and 'outdoor lifestyle' brand retailer, Rivers. Rivers mostly sells casual clothing and footwear for all ages but their brand image is based around the Australian love of the outdoors so you can also buy more utilitarian clothing, backpacks, picnic blankets, wellington boots and other outdoor accessories. A huge part of their brand is about quality tested goods at accessible prices so Rivers advertising material is deliberately 'budget' in style, proclaiming they spend their money on manufacturing rather than marketing. 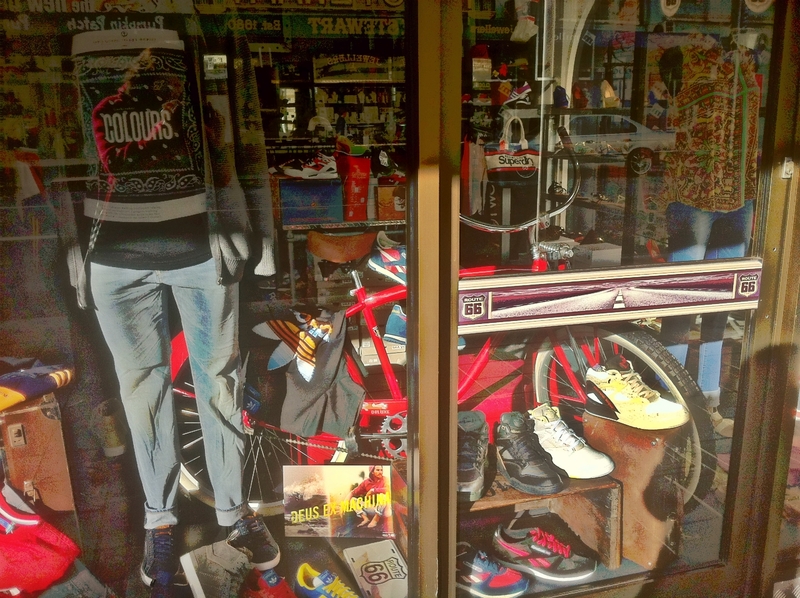 This window display is actually a Rivers Clearance shop - a much larger and less formal set-up than their shopping centre retail presence (which is still quite informal and not costly). The most interesting thing about this bicycle is that it is actually FOR SALE. Previously I had seen a Rivers branded bike in my local WA store but it was only for display. Not to mention a hideously ugly mountain bike with gun metal grey, huge decals and a 'sliced through' suspended seat post. This bicycle looks like a genuine effort to sell, the frame appears unisex and branding is practically invisible. There's even a range of 'Hike and Bike' clothing on offer. Although only for men…sigh. Of course, Rivers is not a bicycle shop so the bike comes in bits and requires professional intervention. I don't know how much it costs or anything about the quality. It's still a shop window bicycle being positioned primarily as a 'leisure' device but it's nice to see that leisure device aimed at a wide market in a regional area.